Jaden Ratiff, left, and Amistad will face Farmington in the Division III championship game on Sunday. East Catholic is 5-7 in its previous appearances, but has won its last two trips. Windsor is 4-2 in previous appearances, last appearing, and winning, in 2014. The most anticipated game of the entire weekend. If it is anywhere near the last game between these two CCC rivals, it will be worth the $10 admission by itself. Windsor blistered East Catholic in the first half of the CCC tournament final on Feb. 28. The Warriors led by 23 points in the third quarter. Then East Catholic made its run and almost came all the way back to win the crown, but Windsor held on for an 87-85 win. Amir ‘Primo’ Spears led Windsor with 41 points, while Jaylin Hunter paced East Catholic with 29. East Catholic won at Windsor 74-52 a month ago. These are probably the state’s two best backcourts with Spears and Corey McKeithan for Windsor and Hunter and Joey Reilly for East Catholic. Windsor will try to keep the pace quick, while East will pick and choose its spots. Don’t be surprised if we need an extra 4 minutes to settle the top team in the state of Connecticut. These two teams met four times last season. East Catholic won the first three, including the CCC tournament final, but Windsor won the matchup in the Division I quarterfinals, at the buzzer in double overtime. Waterford is making its fourth appearance, having gone 2-1 in previous finals. New Britain is 2-2, last appearing in 2002, last winning in 1950. Waterford returns to the Mohegan Sun Arena for the third time in a calendar year. The Lancers won the Division III state championship last season and won the ECC Division I league title nearly three weeks ago. Jay Jay Brennan and Kenny Hill provide a very dependable backcourt. They can score from anywhere and can lock you up on defense. They share the ball, as do the big man Ryan O’Connell, Liam Spellman and Payton Sutman. Waterford prefers an up-tempo style. That will suit New Britain just fine. The Hurricanes also like to run when the opportunity presents itself, so it should make for an entertaining game Sunday night. Kaiyon Gunn, Shamah Charles and Isaiah Jenkins are three of New Britain’s nine seniors hardened by the wars of CCC competition. Waterford is the only team returning to the Mohegan Sun from last year’s five state championship finals. This is Farmington third’s appearance, having lost in the Class S final in both 1937 and 1939. This is Amistad’s first appearance. One of these two teams will win its first state championship. Farmington is the favorite, having played in the state’s best conference, the CCC, and a schedule that included Division II finalist New Britain and semifinalist Glastonbury, as well as Simsbury and East Catholic a combined seven times. Led by senior guard Makhi Hawkins and 6-7 sophomore forward Bube Momah, the Indians will provide Amistad some matchup problems. In turn, Amistad’s guards, A.J. Edwards and Eli Blackwell, can break down any defense and can cause havoc on the defensive end of the floor. 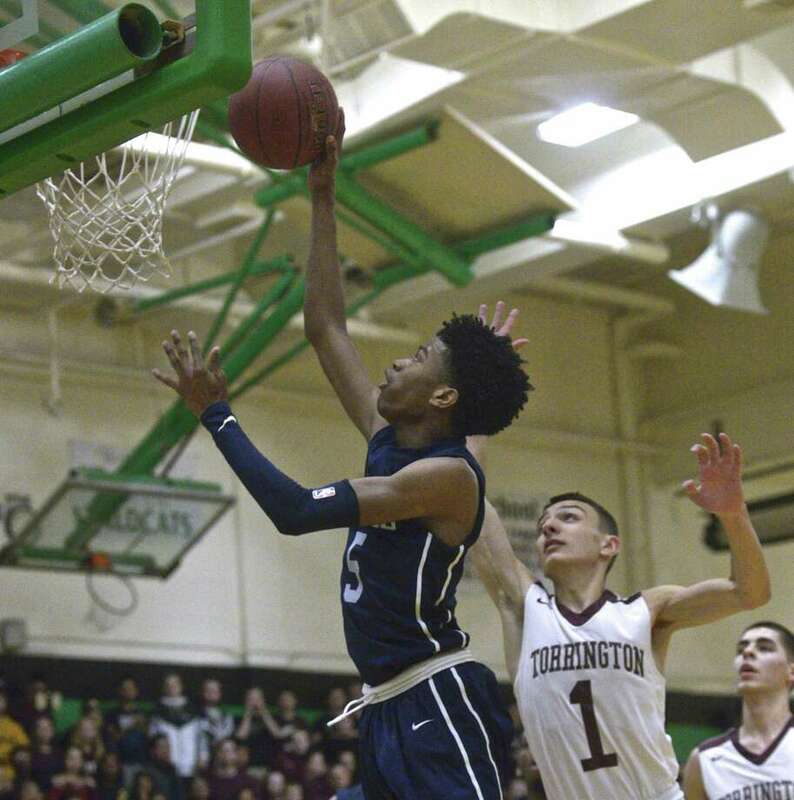 Two other seniors, Isaiah Joyner and Cyprien Joseph (23 points in the semifinals) provide a balance offense for the Wolves, who beat Berlin, Shelton and Torrington in succession to reach Sunday’s game. Amistad is an independent school while Farmington reached the CCC tournament semifinals for the first time in program history. Granby is 1-0, having beaten Weaver in double overtime in 2013. New Canaan is 7-2 in previous trips, the last coming in 1989. It’s the 30th anniversary of New Canaan’s last trip to a state final, so don’t be surprised to see some of those former players on hand at the Sun. The program hadn’t qualified for postseason play in a decade and won just four games two years ago. Matt Brand led the Rams with 21 points in the semifinals against St. Joseph, but it’s been a very balanced team on offense under coach Danny Melzer. Granby was able to win its first NCCC tournament title since 2006 on its home floor, which helped fuel its run to get to Sunday’s final. Also scheduling Simsbury as a non-conference game helped. The Bears have some size, in a pair of 6-foot-4 players Rowan Heinze and Peyton Large, that the Rams will have to contend with. New Canaan is searching for its first state championship since 1962. During its last run to the finals three decades ago, among the teams the Rams beat was Hamden, led by senior and future UConn Hall of Famer Scott Burrell. Innovation owned the Capitol Region Athletic League this season, going unbeaten during the regular season and winning the league tournament crown as well. Balanced scoring by Lenny Okonya, L.J. Hazelwood and Lester Emanuel helped the Ravens slip past Valley Regional in a low-scoring semifinal-round game. All three players should be a factor on Sunday. Old Lyme is led by Aedan Using and Ray Doll, who combined for 49 points in the semifinals against Somers. The Wildcats went out and scheduled Bacon Academy twice and Glastonbury, a Division II semifinalist out of the CCC, to prepare for this run. Old Lyme lost in overtime to Cromwell in the Shoreline Conference tournament final.